George Paxton is a very ordinary man, even though he loves his slightly macabre job chipping names and epitaphs into gravestones. 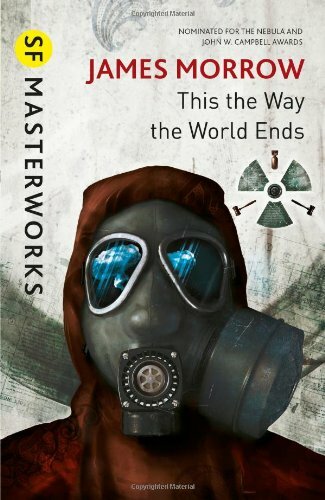 Prudence and being sensible are very much at the core of George’s straightforward approach to life, so he leaps at the chance when offered a free hazard suit to protect his daughter from all the effects of a nuclear war. Sure, he has to sign a contract accepting responsibility for any future nuclear conflict that does occur, but George doesn’t worry about that. The free suit buys him peace of mind. His daughter will be safe if the bombs do fall. Unfortunately George doesn’t even get back from the shop with the suit before the city disappears from his rear-view mirror in a 1-megaton thermonuclear fireball. His daughter has probably been minced by a thousand shards of broken glass travelling at almost the speed of sound. If only she had been wearing her suit, thinks George; everything would have been fine. Meanwhile the end of the world is only the beginning of George’s trials. He’s now going to have to answer for letting it happen. After all, he’s already signed the document that lays the blame at his feet. He may come to regret being rescued from the radioactive wasteland by some black-blooded ghostly types. These ghosts, who refer to themselves as the ‘unadmitted’ are not echoes of the past, but spectres of a future that will never be – all the people who will never be born because the world has incinerated its own potential. This blackly comic novel reminded me of Kurt Vonnegut, specifically Slaughterhouse Five, and not simply in the plotline of a man being taken into a surreal world parallel to our own where he has to answer for the violent ridiculousness of his entire race. James Morrow shares Vonnegut’s somewhat despairing view of mankind’s self-destructive streak – laughing because you have to, really. It was written at a time in US politics when key members of Reagan’s administration were trying to convince him that it was possible to win a nuclear war, and recommending he adopt the SDI missile defence system. Morrow makes it quite clear that believing we can ourselves be safe from the enemy’s nuclear weapons whilst at the same time believing the enemy will always be at risk from ours creates an illusion of safety and supremacy that only makes nuclear conflict more likely. As it is, both the US and Russia deny firing first in this novel, though one or other of them may have launched an ‘anticipatory retaliation’… So still the other guy’s fault, then. Moments of satire, including a fiery argument over whether to use a nuclear submarine’s missile launch tube for purpose or for growing oranges, reminded me of Dr Strangelove taken to an almost surreal extreme. Morrow’s descriptions of nuclear devastation are also darkly comic and surreal, annihilation and suffering made all the more horrific by being described almost flippantly, like imagery from a Monty Python cartoon segment. There are funny asides where the novel appears to be a vision Nostradamus is having for the future. These could have seemed incongruously daft, and also ended up Pythonesque in the wrong way, but Morrow makes it work. The scenes with the smug, conceited Nostradamus casually predicting future doom from a safe distance, where he knows it won’t affect him, help hammer the novel’s message home. Ordinary people enable the destroyers of the earth by either supporting them or claiming there is nothing they can do anyway. But they can’t absolve themselves of guilt and try to shrug off responsibility. Just because George Paxton is the only normal person whose name is on the charge-sheet doesn’t mean he is the only normal person who should have to take the blame.